Subscription boxes have been all the rage for quite some time now, and certainly on my radar for many years of which I'm a subscriber already to two. We've seen beauty boxes, meal boxes, tea boxes and even boxes for your bloody period (literally), most things have been done. But here in the corner are us Mums a little bit forgotten about, not anymore, MamaMe have been thinking about us and they've thought incredibly well. They've designed the cutest and by far my most favourite subscription box that is entirely for Mums. How cool is that? 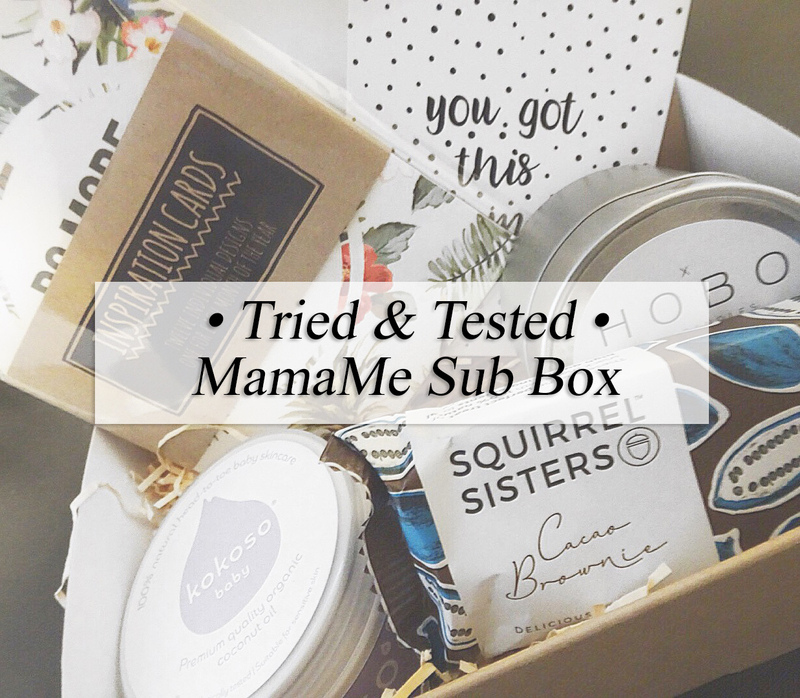 I was incredibly lucky to be one of the first to test them out, when I received their January box this month and my oh my was I seriously impressed with the contents. Now I am a sucker for packaging, I know, I know, it's going in the bin so who cares? Well me, I care and for my first box it got me very excited to see what was inside, but in true blogger style I had to take a picture first, it's so cute and dainty - I loved the little extra touch of ribbon and a tax as opposed to any other box I received which is generally just a printed box. Inside I was delighted with 5 full products, none of this half size, sample size business from MamaMe, again, a huge win over here. I immediately recognised the Kokoso coconut oil which so many parents rave about, I was quite thrilled as I'd eyed it up for some time now and I can safely say after just two weeks we're already thoroughly enjoying it, it's been used on Noahs dry lips, Patricks teething rash, my hair and John even used some on his hands when they were dry from washing bottles. It's a super all round product and I feel like MamaMe have really selected their contents with care and consideration. Next up were some inspiration cards from Native State, something everyone is usually looking for in January - supposedly the bluest month, so a really cute touch. A couple were monochrome design so with a few dashes of washi tape, they've firmly found place in Noahs bedroom on his wall. Who doesn't want some feel good quotes when you first wake up in the morning? The Hobo wood wick candle is a must have, I mean candles to me signify relaxation, unwinding and 'me-time', which as a Mum of two boys now, is rare but something I am trying my hardest to enjoy at least once a week with some face masks and extra long bath soak. Even though I already had a candle on the go, I had to light it pretty sharpish as the small was something else, I didn't burn it long enough to see however the crackle of the wood wick made me feel all cosy and wintery. The last two pieces included a mama wish bracelet with a positive 'You got this Mama' affirmation, something I think we all need to hear once in a while? I like to keep this sitting on my desk as when I'm up for the twelfth time in a night, it's something I have to be reminded of. Lastly, something I certainly don't need to try and fit into every week, some chocolate, the Squirrel Sisters bar was delightful and I was rather cheesed off when the second half I'd saved in the fridge was stifled and eaten by John. Tut. Overall I really enjoyed the MamaMe box, it's easily to see that they're going to become popular, fast. I've already signed up for Februarys box and I'm hoping I can convince John to buy me the subscription for Valentines day. At £25 a pop I think they're definitely worth it, especially when you have the option of 3, 6 and 12 month subscriptions, the contents easily add up to more, and I having seen a sneak peak of Februarys' box on their website, I truly think you're missing out if you don't snap it up. This looks great. Anyone who sends chocolate and candles through the post to me is a winner!! Ooo I love it when you get full bottles and no samples. Makes you feel like you get your money's worth!